Posted on April 2, 2019 by Jack wrote in Dent Repair, Educational. Today we are repairing this damage in a 2013 Cadillac ATS left side quarter panel. This damage impacted so deep it actually pushed the exterior sheet metal into the inner wheel house structure. This severe impact caused the exterior metal to to actually bend outwards and crack the paint on the edge of the panel. This is a choice ultimately only the customer can make. To give you a little more detail about these choices first off lets start off by choosing repaint the panel. The entire panel requires repainting. Everything installed on the panel like tail lights and a bumper, would need to be removed. Other panels may require more items. Items such as door handles, trim, mirrors, glass, moldings and lights. If this paint damage is near any other panels typically anything under 18 inches, the body shop will have to fade or blend, this is the industry term, the color into the other panel. What if the paint is a specialized color like a pearl coat or tri coat, like this vehicle was? That distance spreads much further for blending the paint. For this vehicle the left rear door, left quater panel and rear bumper would all need to be repainted. A minor scratch in one panel, say a door for example, could mean the ENTIRE side of the vehicle being repainted to get a correct color match! Imagine a black shirt with a black button on it. Now the button blends in pretty well but it is still visible. This explains how a paint touch up might look when completed. Solid colors such as a straight black is the best candidate for touch up repairs. Other colors like pearl coats, quad coats and other unique colors like this, are sometimes not the best choice for touch up. At a minimum a small coat of a clear coat should always be applied over a small crack or chip to at least seal it from the outside elements. This customer was actually referred to us from another body shop in Tea, South Dakota. 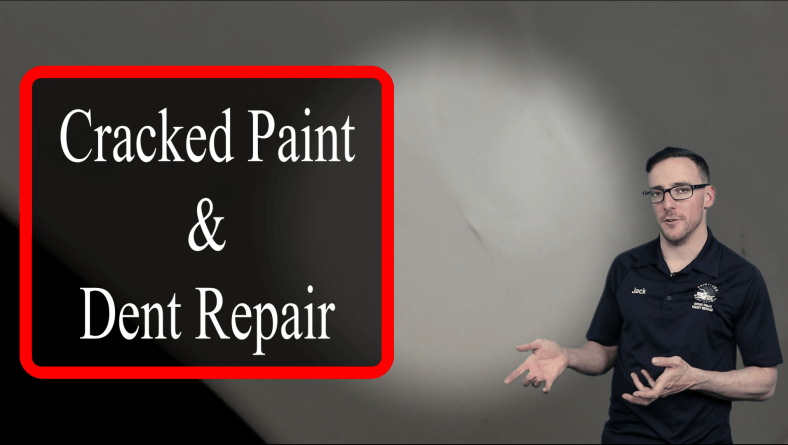 The customer was a friend of theirs and the Body Shop knew that this repair would get extremely costly for the customer because of the pearl white tri coat stage paint finish. The customer did the paint touch up themselves and live with any possible color mismatch, they just wanted the dents to be repaired and we were happy to provide this service for them!